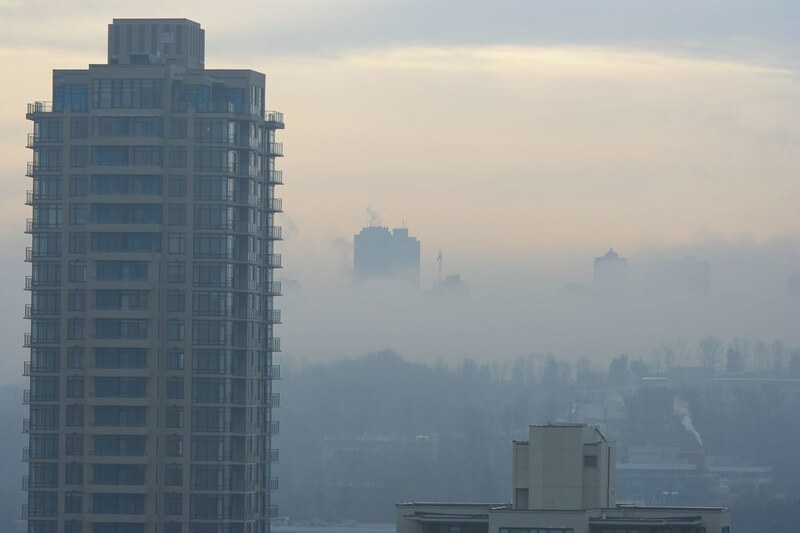 Picture taken from my patio in Burnaby, BC, this morning. I played a late night hockey game last night and was really tired this morning. Tired, that is, until I rolled over and saw the sun starting to rise. It was absolutely beautiful, particularly after the fog we’ve been having here for the last few days. 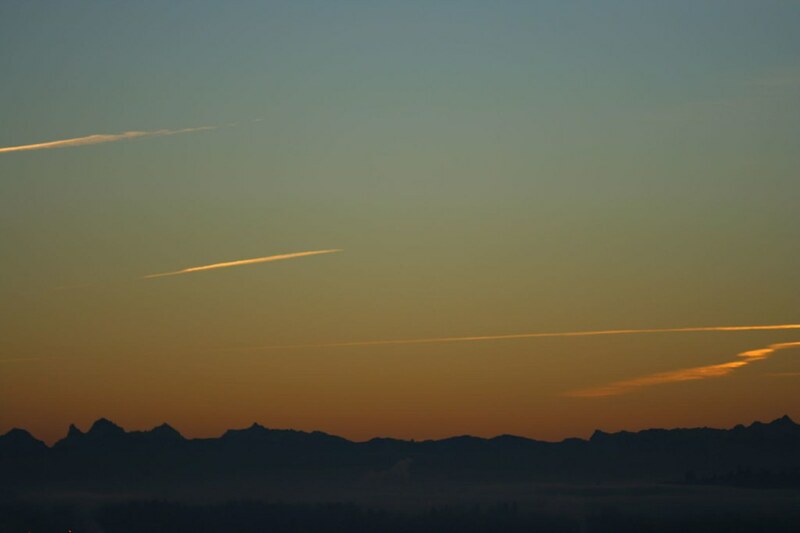 There are a few more pics of the sunrise in Burnaby this morning on my Flickr account. This is a pic of the fog from yesterday. Visit WordPress for a full list of WordPress 2.1 upgrades. The upgrade took only a few minutes after I backed up the database. It was great. Have a look. I think you’ll like it. All the details you ever wanted to know about the movie and controversy are available at Wikipedia. During the 2004 Presidential election John Edwards’ “Two Americas” speech seemed like a rather unoriginal way to describe the growing divide in this country. But now, after having spent almost a year shuttling back and forth between the religious heartland of Missouri, and home in New York City, the “two Americas” concept has taken on an entirely new meaning. Clearly there are two parallel Americas: and one is a conservative counterculture comprised of tens of millions of Evangelical Christians who feel engaged in a culture war with what they perceive as immorality and godless liberalism. They consume their own news and popular culture via Christian television, radio, and publications, and carefully expose their children both to a literal interpretation of the bible and a call to political activism. *Amazon says the DVD release date is January 23rd, but I’m sure they said the 31st on Gill Deacon today. Let me know what you thought of the movie if you’ve seen it. If you haven’t seen it, do you think you will? What are you doing for Hockey Day in Canada? Watch the Canucks play the Leafs on Hockey Day in Canada at GM Place for only $5. UPDATE: John Bollwitt snapped a bunch of pics of Hockey Day in Canada at GM Place. Get a group together and you can watch the Canucks play the Leafs at GM place on Hockey Day in Canada for only $5. Tickets are $12 if you buy them individually. Saturday, Jan 13, 2007 is Hockey Day in Canada. The Vancouver Canucks are going to be playing against the Toronto Maple Leafs at the Air Canada Centre in Toronto and the game will be broadcast in HD by CBC. To celebrate Hockey Day in Canada the Canucks and UBC are showing the game on the big screen at GM Place followed by a UBC hockey game at GM Place. UBC is hoping to break the collegiate attendance record in their game against the Regina Cougars. 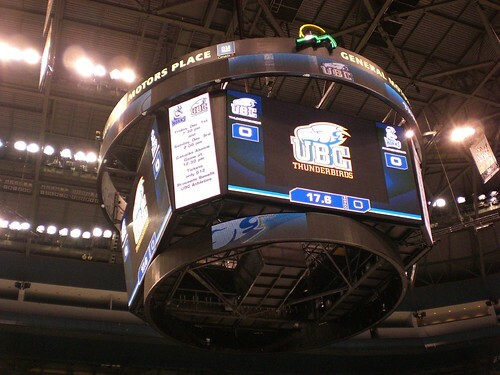 Come down and watch the Canucks vs. Leafs game on the new Orca Bay Scoreboard before the UBC game! Be a part of Hockey Day in Canada as we attempt to set the record for the most fans to see a University Hockey game in Canada! Doors open at 3:00pm. Directly after the conclusion of the Canucks game, YOUR UBC THUNDERBIRDS men’s hockey team is hosting the Regina Cougars. Help us make CANADIAN HOCKEY HISTORY as the UBC Thunderbirds and Vancouver Canucks will attempt to set a Canadian Interuniversity Sport attendance record. Get your friends, team, family or school together and join us for a spot in Canadian Hockey History! Groups of 10 or more are only $5 per person. Tickets only $7 for UBC Students and $12 for general public. Family packages are available. Celebrate Hockey Day in Canada. Get a group together and head down to GM Place to watch “your Vancouver Canucks” beat down the Leafs on the best HD system in the NHL. So I finally got around to incorporating my Flickr account into my blog. You can see it over there, on the right side of your screen. I’ve considered adding the Flickr badge a few times in the past but I didn’t really like to standard options offered by Flickr. Today I did a quick Google search for Flickr Badges and found Veerle’s Blog listed in the top 5. Veerle’s blog has a great tutorial on making your standard Flickr badge W3C compliant. My blog template is quite different than Veerle’s blog, so I had to make some changes to her html and css to make it work for me. But if you know html/css it’s very straightforward. It looks like the only thing that isn’t validating on the blog now are my embedded Youtube files. Other than that, she’s good to go. So a big thank you to Veerle for the tutorial and all the other interesting stuff on her blog.